The Yutazinskiy rayon in Tatarstan, Russia, has a flag. 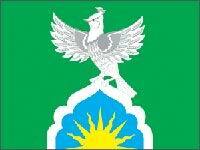 It was adopted by Rayon Council on July 18th 2005. I found it here.